The Disney Food Blog posted how to make (legit) Mickey Waffles at home. Really?! Aside from the unobtainable waffle iron, all it takes is the right mix. Yeah! A Mix! I followed the link in the DFB post but then I found I could get the mix cheaper at Amazon. So, I had Mickey-less Mickey Waffles for breakfast this weekend. I love Prime shipping. Was it as simple as using the appropriate mix? Yup. I thought my waffles might have been a bit drier but I'm not positive (I eat mine doused in strawberries so it's hard to be sure). It could be a difference in the pan, or even the cooking spray, or maybe the Disney waffles sitting before they're served; it was pretty minimal. You do know your waffle iron will make the biggest difference in texture, right? The first waffle iron we had when we were married was a hand-me-down from my parents. I don't know why my mother had a second waffle iron. We had always had a decent waffle iron (and a different style). The hand-me-down was only suitable for playing second (or fourth) string. My husband and I never made waffles because it made damp-dry waffles. That's pretty hard. Too soft on the outside and too dry on the inside, yuck. That appliance has been gone for years but we only just replaced it. I was terrified of wasting money on another dud. For a while, I was considering an $80 waffle iron which met Cook's Illustrated's standards. Instead, I decided to buy a stovetop Belgian waffle iron. 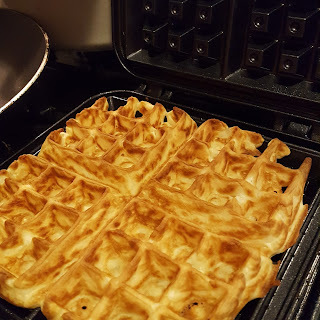 I'm not a huge Belgian waffle fan but the stove top version is easy to take care of, easy to store, and I have plans to misuse it for hashbrowns, quesadillas, maybe even paninis. It turned out to be perfect for Mickey-less Mickey waffles. My waffles were not gorgeous. They ended up streaky but I didn't notice this in the taste or texture. Since this is a review, I didn't take a ton of pictures (my house is a nightmare for getting good lighting for photos). Here is an image to give you an idea of what I mean by "streaky." Also, you can see the waffle iron will stand open on its own (it is actually two pieces which is why it's so easy to clean). Following the recipe on the package, I was able to fill my pan twice. However, the edges weren't complete (as you can see, that's the first waffle). I'd guess the recipe on the back would result in 1 1/2 pans if completely filled to the edge. This is less than other recipes I've used, and I liked that. I don't like leftover waffle batter. If you've got a large family or gathering, you'll be making more than one batch. Good news, you buy in bulk on Amazon and it gets even cheaper. Personally, I'll be sticking with Carbon's Golden Malted Pancake and Waffle Mix for all my waffles in future. I'm not a giant waffle fan (I do love breakfast, though). I've often found I only like waffles drowning in butter and syrup and I just don't need to eat that. There's enough extra flavor with this mix, I don't need tons of unhealthy additions. The waffles are crisp enough to take lots of fruit "syrup," though. 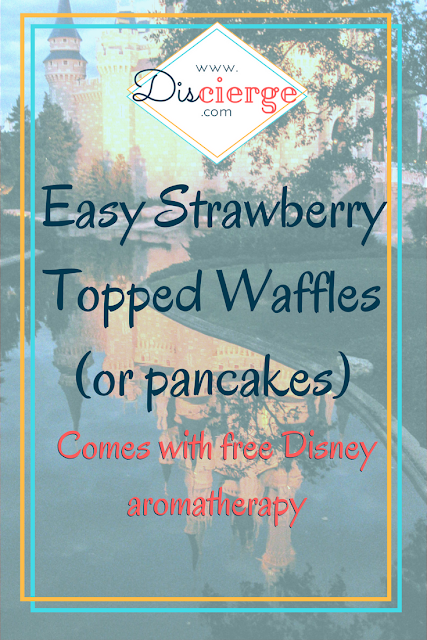 (Bonus, your house will smell like Mickey waffles. I don't know if it's the malt or the vanilla or the combination of the two but it's a very pleasant, not just food, smell---and it smells like the start of a day at WDW!!!). Let me tell you about my quick and easy strawberry syrup, as that is part of the Mickey-waffle-experience for me. First, I won't call this a recipe. I wanted something that would be ready when the waffles were ready so this is more of a technique you can tweak to fit your time. Start the syrup, first. I ended up with about twice as much as I needed (and as I said, mine were doused in strawberries). This was for the waffle recipe made as stated on the package. It's hard to make a super small amount of strawberry syrup unless you have a very small pan (my pan is pretty small and I didn't want to make any less simple syrup, which is the base, for fear it'd evaporate and caramelize or burn before the strawberries "melted"). I made my simple syrup when I started my strawberries, you could use some you already had. Simple syrup is equal parts sugar and water, the sugar dissolved in boiling water. If your simply syrup is refirgerated, you'll need to heat it up , first. Add the frozen strawberries to the boiling simple syrup and let heat through. This can take awhile. It depends on the size of your pan, the strawberries, etc. You can put a lid on the pot to speed it up. Use a potato masher to mash up everything when it's soft. You can then toss in the fresh strawberries and mash once they are sufficiently soft. That will obviously depend on how soft they are to start with. That's it. You can add more water if it doesn't seem thin enough or let a bit evaporate if it's too watery. Frozen strawberries will not be consistent in size so there's no point in my trying to tell you exactly what to do. Plus, if you have young kids, they might interrupt you (as mine did) so flexible is good. Keep the temperature low if you'll be walking away. I have literally burned an entire pan of syrup before (we're talking charred, blakened flakes, nothing resembling syrup or even strawberries left, and that wasn't a major distraction!). Small quantities of sugar will do that easily. I also served our waffles with sliced fresh strawberries, fresh blueberries, and fat-free cool whip. It tasted just like what we had at Animal Kingdom Lodge a few weeks ago, but without all the guilt of the huge amount of real whipped cream. I'd estimate this recipe is 1/4c. simple syrup and about 1c. frozen strawberries. If they're defrosted, it'll go even faster. Concerned about sugar? This served two adults and two young kids. That's about 2 tablespoons of sugar between the four of us (I started with 1/2c. sugar and used half to make the syrup---that's 1/4c.---we only ate half of what I made which is 2 tablespoons). I could have gone with less. That's the beauty of making this with simple syrup instead of something like jam, honey, etc. You know exactly how much sugar you are using and can easily reduce it. I might tweak my simple syrup next time I make the waffles and start with 1/4 of what I make and then double it with water. I don't have a lot of uses for watered down simple syrup so I either need to use all of it for strawberry syrup or water down just the portion I'm using. If you are happy using something like Splenda, Stevia, or another granular sugar substitute, you may be able to start with water and add your sweetner to taste once your "syrup" is made. Real sugar is too hard to dissolve at this point but when I've used Stevia in other items, I haven't had that problem. Finally, note that it is possible to alter the flavor by over cooking the strawberries. I've done this once trying to cook out excess water too quickly. I don't know exactly what I did but I believe I started caramelizing the sugars. As long as this doesn't happen, you can use your leftover syrup in drinks (think homemade soda, strawberry daiquiris, etc.). The syrup tastes like strawberries with sugar so you can use it anywhere you'd use pureed strawberries and simple syrup (just puree it). 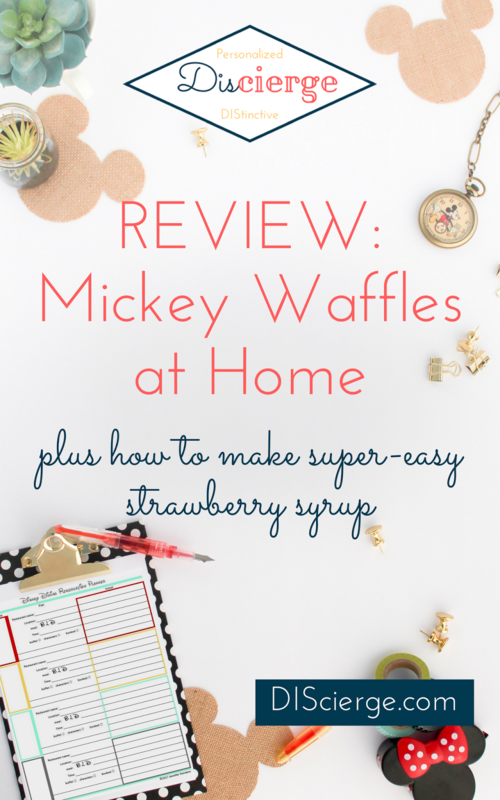 Will You Be Trying Mickey Waffles At Home? So let's wrap up Mickey waffles at home. Get the Malted Mix and follow the directions on the package. Don't buy a Mickey waffle iron without carefully reading the reviews. I've read some pretty bad ones plus it's obvious from the pictures, not all make "waffles" so much as a pancake with a Mickey face. I love my stove top Belgian waffle maker for this application. If you enjoy the strawberry topping on your Mickey waffles, try my technique for easy strawberry syrup. You can also add fresh fruit and your choice of whipped topping. Or keep it simple with butter and syrup. I'm hoping in a few weeks to use the mix to make strawberry shortcakes.Do you have a favorite copycat recipe from a Disney park (or maybe even a cruise)? Please share in the comments!